Up at 6 to be on the tender at 8:15 which takes us from our ship to the dock where our bus awaits us. It will take us to Nice, Monaco, Monte Carlo. We drive along the coast. All the buildings are very clean and nice. 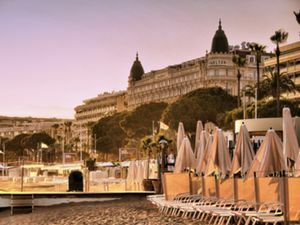 We pass the famous building where the Cannes Film Festival is held each year. We see many huge expensive yachts. We pass by the famous Monte Carlo Casino and on to the principality of Monaco where Prince Rainier lives. He is not at home when we arrive. The weather is not good and keeps trying to rain on us. It's a good walk past Caroline's and Stephanie's homes. We enter the church and see the tomb of Princess Grace. We don't enter the palace. I buy a T shirt. There are TV cameras everywhere watching everyone. We take a long drive through the mountains for lunch and tour the perfume factory in Grassi. I'm exhausted when we return at 6:00. Hurry to dinner. Not hungry. Pack and go to bed. This sounds like a fun day on the French Riviera. I have never visited this area of France, having only travelled to Paris. American actress Grace Kelly married Prince Rainier III of Monaco in 1956. It was called the Wedding of the Century by the press at the time. The prince and princess had 3 children, Caroline, Albert and Stephanie. On September 13, 1982, while driving with her daughter, Stéphanie, Princess Grace suffered a stroke, which caused her to drive her car off the serpentine road down a mountainside. She died the next day at the age of 52. Her daughter Stephanie survived the accident. Prince Rainier lived to the ripe old age of 81 and died April 6, 2005. He was buried on April 15, 2005, beside his wife, Princess Grace, at the Saint Nicholas Cathedral, the resting place of previous sovereign princes of Monaco and several of their wives, and the place where Prince Rainier and Princess Grace had been married in 1956.